Visit Maui with the Amateur Traveler: This video shows the winding road to Hana on the North Eastern shore of Maui with its cliffs, streams and waterfalls. In addition it shows two lava tube experiences. In Wai‘anapanapa State Park just outside of Maui you can swim in a lava tube that is now filled with fresh water. 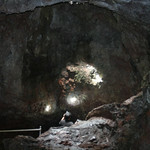 At Ka`Eleku Caverns you can hike a quarter of a mile into a lava tube towards the volcano along an interpretive trail. Neither lava tube experience is for those afraid of the dark or claustrophobic.